Try to imagine climbing into this berth for the night. Your head begins to fill with thoughts of your homeland, and your heart aches for the family and friends you've left behind. You have thoughts of the future, wondering what it might hold. Could you dare to believe it can be as wonderful as stories you've heard from friends and relatives that have gone ahead of you? Not everyone survived the journey. 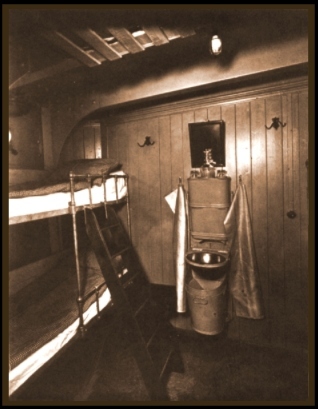 Especially in steerage, where many, many people shared one common space for the entire journey, illness and disease quickly spread to others. And dying on a voyage meant burial at sea. A journey of this sort was costly and often fraught with danger. They were at the mercy of the sea, facing uncertain weather conditions, and the possibility of contracting illness or disease from other passengers. Even after all that, there was no guarantee they would even be permitted to stay in the promising, new land they had worked so hard to get to. They would still have to clear Immigration. The cabins of these ships held enormous secrets. They were the keepers of untold numbers of heartfelt prayers, letters penned home to loved ones, passages written in diaries, questions, fears, private tears... as well as hopes and dreams.